The Pomegranate Theatre Archive is spread across three locations - the theatre, Chesterfield Library and Chesterfield Museum. We have made some progress in cross-referencing what is where. miscellaneous items ( sound effects (on records), correspondence and scrapbooks). We are scrutinising the content of each programme and summarising the key features using a standard form - known as the Programme Review Form (PRF). These forms are listed per decade and those already entered can be accessed on this website. The original programmes are housed currently at the theatre and in temporary storage. They can only be accessed by request. 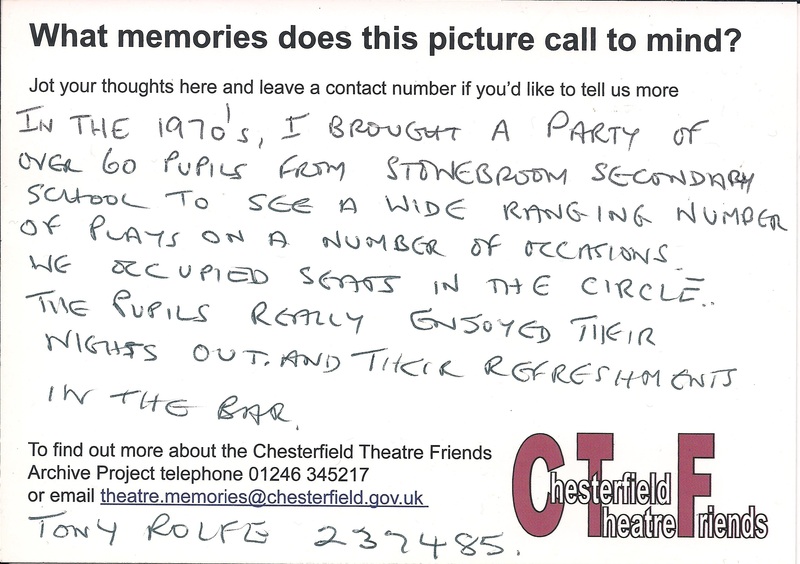 oral memories - recorded reflections from people who know the theatre from their personal involvement in its life and work. professional actors and production directors (most especially those who visit the theatre on a regular basis - e.g. Rumpus Theatre, Tabs Productions and Talking Scarlet). In partnership with Chesterfield Sewing Club various authentic-like custumes, stage props and play artefacts are being added to the theatre or museum collections. These largely arise from supporting local history productions written and designed by the Pomegranate Youth Theatre. We are also compiling notes on Using theatre archive material and we hope to present these on the site in the near future. Production Type: Music/dance.Live broadast from the Opera House.